Solomon and his keeper, Subhro, begin in dismal conditions, forgotten in a corner of the palace grounds. When it occurs to the king and queen that an elephant would be an appropriate wedding gift, everyone rushes to get them ready: Subhro is given two new suits of clothes and Solomon a long overdue scrub. They cross the border into Spain at Castelo Rodrigo and meet the Archduke at Valladolid. Accompanied by the Archduke, his new wife, the royal guard, Soloman and Subhro cross a continent riven by the Reformation and civil wars. They make their way through the storied cities of northern Italy: Genoa, Piacenza, Mantua, Verona, Venice, and Trento, where the Council of Trent is in session. They brave the Alps and the terrifying Isarco and Brenner Passes; they sail from Rosas across the Mediterranean Sea and later up the Inn River (elephants, it turns out, are natural sailors). At last they make their grand entry into the imperial city. The Elephant's Journey is a tale of friendship and adventure. 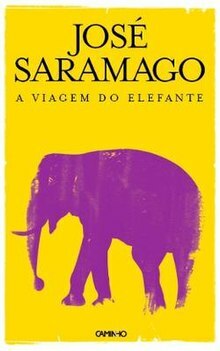 The novel was translated into English by Margaret Jull Costa and published in 2010. 2011 Oxford-Weidenfeld Translation Prize — Winner (English translation). This page was last edited on 21 May 2018, at 00:45 (UTC).